When Heinrich Böll traveled with his wife to Ireland in the early 1950’s, he was immediately enchanted by the landscape and the people. Reveling in respite from a Europe still recovering from war, he was captivated by what he saw as a friendly and classless society that took life at a more leisurely pace. He was delighted, for example, by the Irish saying that explained why the trains were always late: “When God made time he made plenty of it.” Böll would return again and again. 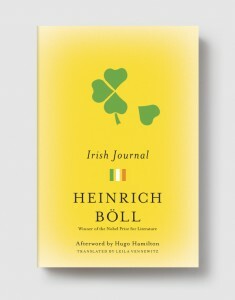 In this unique entry in his oeuvre, Böll documents his eccentric travels around the Emerald Isle, detailing its charm in a way that gives his own habit of studying character and paradox, not to mention national identity, a beguiling twist. The result, here presented with an epilogue written years later with Böll’s observation of changes since his first visit, is a reflection on the essence of a place and its people that is, indeed, evergreen.